A personal budget is a clear, upfront amount of money identified by the Local Authority that can be used to arrange some of the support that has been agreed in your child or young persons Education, Health and Care plan (EHCP). The amount that your child/young person gets depends on the needs and outcomes identified in their plan. This is decided through an Education, Health and Care Assessment or at the review of an EHC Plan. A Personal Budget must be used to meet the outcomes that are set out in a child or young persons EHC Plan. A Personal Budget is not additional money. It is not the total sum of all the money that is used to support a child or young person with an EHC Plan. The Local Authority does not need to list all of the costs associated with supporting a child or young person, just the parts that parents can have control over. The reason for the introduction of Personal Budgets is to give you more choice and control over the services that your child/young person receives. Personal Budgets are a choice. You do not have to use a Personal Budget if you do not think that this is the best option for your child and family. The decision on which option is best will be made between you and your Assessment Coordinator and this decision will be included in the EHC Plan. In some circumstances the choice of a direct payment may be withheld. The reason for this is likely to be where there are safeguarding concerns. These will be discussed with you by your assessment coordinator or lead professional. If your child or young person is eligible for more than one of the above services, funding from the different agencies could be combined into one personal budget and used to plan and provide support in a more joined up way. This would be planned through the EHC Plan and linked to outcomes within the plan. For example, a young person eligible for specialist short breaks and for SEN top up funding could pool the funding to employ a joined up support team who could deliver continuity between school and home including over the school holidays. 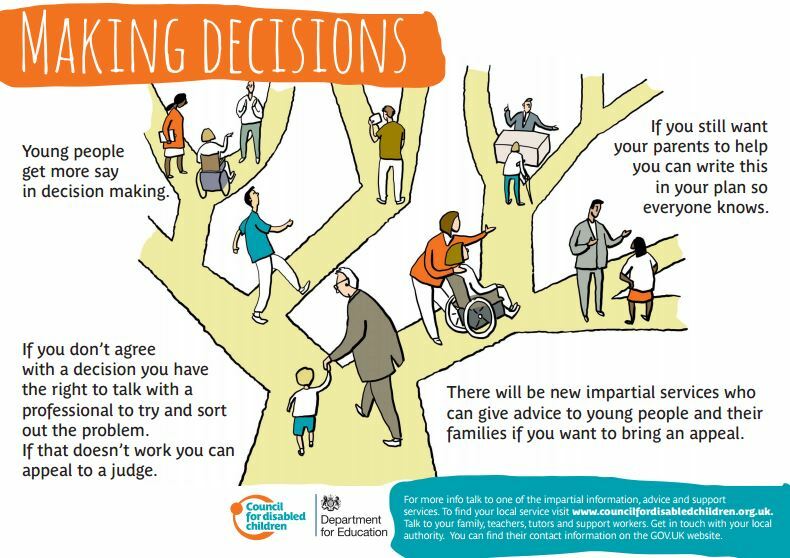 If your child or young person has had an EHC assessment and there is agreement to issue an EHC Plan, you will have the right to request a personal budget. You may also request a personal budget through the statutory review of an EHC Plan or when your child is being transferred from a Statement of SEN to an EHC plan. In all cases, the availability of a personal budget will be based on the support your child or young person needs in order for them to achieve a set of agreed outcomes and to have their identified support needs met. In some cases an EHCP may not result in your child or young person having a personal budget. In other cases your child or young person may have a personal budget from more than one source, i.e. education, health and social care. If your child or young person is eligible for specialist short breaks, you will have the choice of a personal budget and a range of options of how best to use the budget. Your assessment coordinator or lead professional will discuss the options with you. Overnight short breaks will not be an option for everyone with a social care personal budget as these are prioritised for those with specific behaviour or health needs which affect their own or their families sleep. If your child or young person is eligible for continuing care or continuing healthcare, you have a right to request a personal budget and from October 2014 you have a right to have a personal budget subject to certain clinical and financial limits. In the same way as social care and education personal budgets, you will have a choice over how the personal health budget is managed and this could be by the CCG, by a third party or as a direct payment to yourself. A young person found eligible for NHS Continuing Healthcare or their carer can ask their community nurse or the Continuing health care coordinator for your services to be provided via a personal health budget. Personal budgets will not normally be available for services that a school or college provides from its own budget, as part of their local offer. This means that the scope of a personal budget will differ depending on the school. It may be that a school already providers the specialist provision required and therefore a personal budget would not be available. For example, the opportunities for a personal budget in a special school will be fewer than in a mainstream school and this may be something parent/carers and young people wish to consider when making their school preference. This means that the inclusion of education funding in a personal budget will most commonly be focused on supporting those children and young people with the most complex learning support needs. The school or college must agree with plans to support a child or young person through the use of a direct payment where it is to be used for equipment or a service that will be used or delivered on the school or college premises. If you take a PTB you are opting out of Council provided transport and have responsibility for getting your child to/from school. Please see our school transport policy for more information.